And don't forget our amazing air quality, low crime rate, and low cost of living. 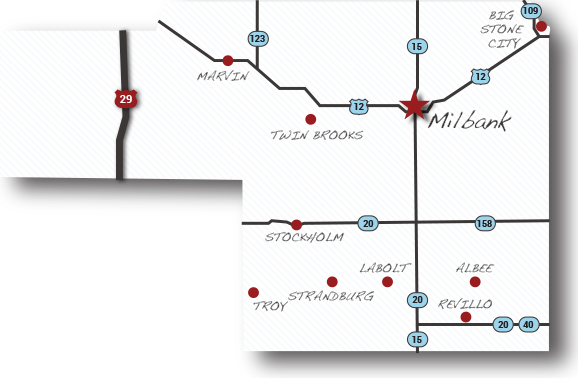 It's no wonder Milbank has been rated one of the Top 10 Cities in South Dakota. Milbank's new 71,532 square foot Avera hospital facility will include 29 exam rooms, 13 inpatient rooms, emergency department, heliport, and more. Birthplace of American Legion Baseball! Proposed in 1925, today over 5,000 teams from all 50 states participate in American Legion Baseball, and it all started right here. With a cost of living 12% below the national average and overall prosperity up by 3%, can you afford not to live in Grant County? Growing funding and numbers of advanced scientific workers combine with South Dakota's unbeatable tax climate in the perfect environment for business success. At Grant County Development Corporation we are committed to economic development in Grant County, South Dakota. This site is intended to be a comprehensive resource for site selectors and new and existing businesses. Find area information in the Community Profiles module, available commercial sites and properties can be searched through the Real Estate tool. Find available incentives and loans, local community contacts, training opportunities, and file downloads in the Business Resources section. GCDC is an equal opportunity provider and employer.